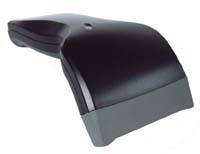 The Phoenix II barcode reader really is that easy to setup and use." The Peninsula Phoenix II barcode reader allows you to read barcodes directly into any application with no extra software required. boxes or software, everything is built into the scanner itself. The Phoenix II is easy to set up, simply plug in and start scanning, can read all common barcode types, ie GS1 13, EAN13, GS1 128, UPC, Code39, Code 128 and many others including specialist codes such as Code 32, Telepen and Laetus. Fully Programmable features including hands free, triggerless, prefix and suffix (Up to 10 characters at the end or start of the barcode used to automate lookup or search routines). The Phoenix II also has an advanced data editing capability. Low power consumption, 2 year RTB guarantee. Includes many programmable features only available on scanners 4 times the price. Works with ALL computers including PC, Macintosh, Laptops, Terminals, a simple cable change is all that is required. No adaptors are required at extra cost to use on USB or laptop computers. Comes complete, all cables for the computer of your choice are included in the box. Works on Mac OS 7 - 9.2 and also on Mac OSX. Works on PC Windows all versions including 2000 and XP. Available with interfaces for USB, ADB, PS2 or PCAT, or RS232. Available in a choice of colours of Black or Ivory.